LOS ANGELES – L.A. Unified serves breakfast to more low-income students than any district in the nation, with nearly 290,000 youngsters consuming the first meal of the day after arriving at school, a study released today says. According to the annual report by the Food Research & Action Center, a national anti-hunger advocacy group, L.A. Unified offered free breakfast to students at 880 of its schools in 2015-16. Most participating schools serve a full meal in the classroom. Others offer students a “grab-and-go” option, and some open their campus cafeteria before the first bell rings. The Food Research & Action Center’s goal is for school districts to serve breakfast to 70 low-income students for every 100 who participate in the school lunch program. L.A. Unified exceeds this goal, serving about 40,000 more breakfast meals than lunches on the average day. 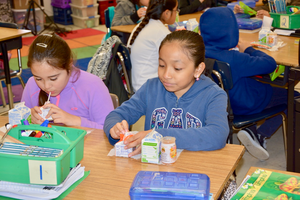 In addition, the number of District students receiving breakfast increased more than 3 percent in 2015-16 from the prior year, with nearly 9,000 more youngsters participating in the program. Approximately 405,000 students, or 72.4 percent, of L.A. Unified students qualified for free and reduced-price meals, based on their family’s income.